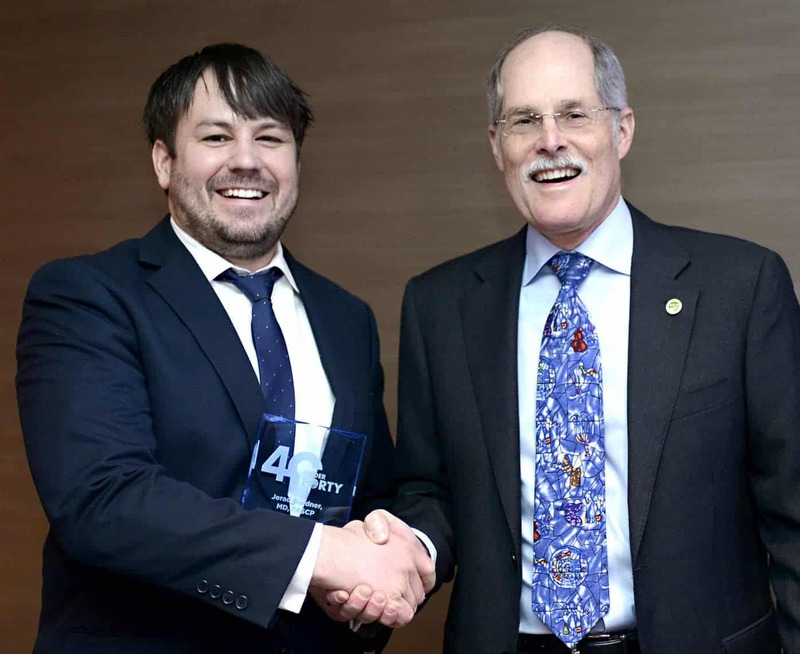 Sept. 25, 2017 | Sept. 25, 2017 | Jerad Gardner, M.D., an associate professor in the University of Arkansas for Medical Sciences (UAMS) College of Medicine’s Departments of Pathology and Dermatology, was named among the top five of the American Society for Clinical Pathology’s “40 Under 40” 2017 list. The “40 Under 40” list honors pathologists and laboratory medicine professionals globally under the age of 40. Gardner was named among the top five at the society’s annual meeting, Sept. 6-8 in Chicago. The honorees come from various health systems and universities around the world. Each was selected based on their achievements and leadership qualities that impact the field of pathology and laboratory medicine. The top five were selected as “true future leaders who are advancing the next generation of professionals,” according to the society. Gardner was also elected in August to the American Society of Dermatopathology Board of Directors through 2020. Gardner is a dermatopathologist and bone/soft tissue sarcoma pathologist. He directs the dermatopathology fellowship program and co-directs the musculoskeletal/skin module, both in the College of Medicine.Gardner has lectured internationally on bone and soft tissue tumors and skin disease. He also speaks to health care professionals nationally and internationally on how to use Facebook, Twitter and Instagram professionally. Gardner was one of the first to use social media in his field and is now the chair of social media subcommittees for two pathology organizations — the American Society of Dermatopathology and the United States and Canadian Academy of Pathology. He has created Facebook discussion groups for pathologists that now have 18,000 and 25,000 followers and has created a social media guide for pathologists. He also volunteers with rare cancer patient support groups on Facebook.